Posted on May 23, 2016 by Lea S.
Nearly every major 1920s comedian couldn’t resist putting their own spins on certain characters and comedy situations. Everyone from Stan Laurel to Buster Keaton showed up as inept boxers, white-clad street cleaners, and waiters in busy cafes–and sooner or later, most of them went to college. 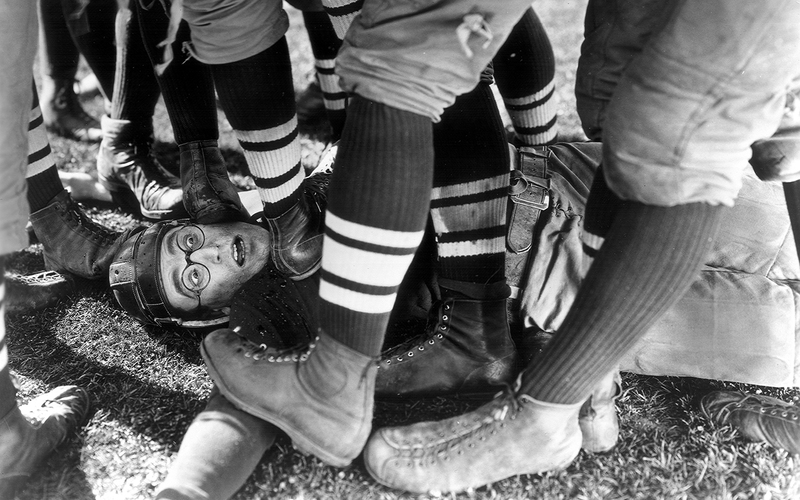 In 1925 it was Harold Lloyd’s turn, and the result was one of his biggest moneymakers: The Freshman! It’s not only the supreme example of a Jazz Age college comedy, but it’s one of my favorite feel-good films. Lloyd’s work is pretty darn feel-good in general, but I find myself returning to The Freshman time and time again. There’s something about it that anyone can relate to. Lloyd plays Harold Lamb, a young man bound for the university whose head is filled with eager dreams of becoming the most popular man on campus. Because “1920s,” that would entail winning people over with a jig/handshake combo and becoming a football star–or so Harold believes, based on his viewings of a movie called The College Hero (his mother says, “he saw it six times yesterday”). By the way, I get a kick out of how there’s absolutely nothing in this film about classes or studying of any kind. Harold arrives at college fondly assuming he will be a College Hero in no time. Naturally, instead of becoming a star football player he ends up being a living tackle dummy, and instead of becoming popular he ends up becoming the secret laughingstock of the college. 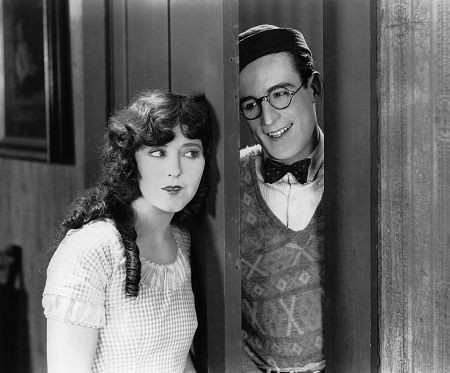 Fortunately Harold has a secret weapon–the love of Peggy (Jobyna Ralston), “the kind of girl your mother must have been.” Peggy alone understands Harold and defends him, and it’s Peggy who encourages Harold to “Stop pretending…be yourself!” which gives him the strength to make a big comeback at the Football Game of the Year. The ending is predictable, but it’s the journey there that makes it work. While Lloyd is always given recognition as the “Third Genius” of silent comedy, his work isn’t discussed nearly as often as Keaton’s and Chaplin’s (and Langdon’s–don’t forget Harry!). Lloyd’s fans tend to be considerably quieter than those of the other two clowns (that is, three clowns–Harry!). Uplifting films like The Freshman remind us why Lloyd’s place in the comedy ranking is absolutely set in stone. Like in all of Lloyd’s features, the production values practically glow and the laughs are spaced just right. A special shout out to those endearing, witty title cards (my fave: “Tate University–a large football stadium with a college attached”). And then there’s Harold Lamb. We laugh at Harold’s naivete–but do we really laugh that hard? Who among us couldn’t identify with dreaming of being “popular,” or rather, of being admired by everyone around you? Isn’t that always the deepest, most fundamental desire behind every ambitious goal? In the scene where Harold realizes the whole college is laughing at him (and at a party where he’s the host, no less), we identify with his shock and crushing sorrow. The scene mirrors the very opposite of our deepest desires: being humiliated and outcast. Harold lives through it for us. And it’s Peggy who gives Harold the push he needs. She’s thoughtful, clear-eyed, and knows how to address the heart of a problem. Lloyd and Ralston worked together beautifully, and their characters’ romance feels refreshingly real. The scene where Harold kisses her for the first time and they both laugh from the giddy joy of it has a permanent spot on my “Top 10 Best Romantic Silent Scenes” list. Harold’s decision to beat the odds and end up a hero is what ultimately makes this such a feel-good film for me. Once his mind is set, he’s alive with fiery determination. He simply does not give up, no matter what. He proves himself to be the man that Peggy knew he was all along. Today, film heroes are usually allowed to triumph, but the triumph is often somewhat deflated since we usually have to sit through scene after slow-dragging scene of self-doubt, introspection, angst, and other assorted miseries (which are usually more miserable for us than the hero). I find darkness in art fascinating (Lord of the Flies is one of my favorite books), but there’s a line between being realistic and/or gritty and just being a drag. Lloyd’s work is so timeless not only because his “glasses” character was so determined, but because his work is infused with inspiring optimism. “Glasses” was the ideal hero of the peppy Jazz Age generation, and he’s a real tonic for we viewers of the fashionably jaded 21st century. 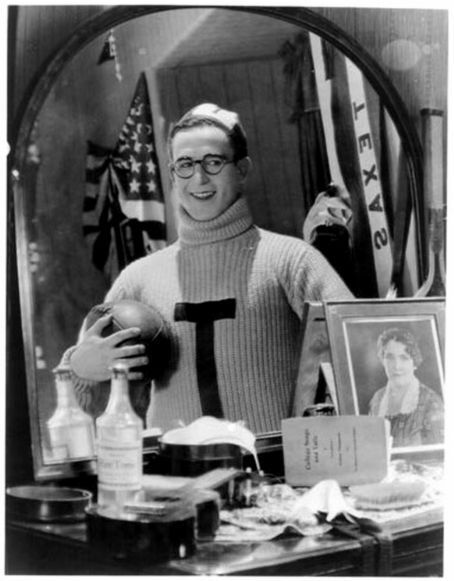 This entry was posted in Blogathons, Thoughts on Films and tagged blogathons, college comedies, Harold Lloyd, silent comedy, The Freshman by Lea S.. Bookmark the permalink. I must admit I had never seen an Harold Lloyd’s film Sounds like a great one to start with! You’ll love Lloyd!! If silent comedy is like candy, then Lloyd’s films are like the best, most decadent cheesecake ever. 😀 Nice to see you, Virginie! I wonder why college movies were so pouplar among silent comedians, since they were not quite the right age, yet it didn’t seem to disturb them 🙂 I’ve seen both this film and Keaton’s “College” and in my opinon this was the superior one. Though my favourite Lloyd movie is Hot Water, this one also cheered me up when I saw it, so I think it was a great choice for this blogathon! Glad you stopped by, feel free to browse anytime! I love Harold Lloyd! As much as I love Keaton, Chaplin, and Langdon, I have to say he’s probably my favorite, and The Freshman is absolutely one of his best. The scene with the disintegration of the suit is one of the funniest things that’s ever been on the screen. I’m glad you commented on the chemistry between Lloyd and Jobyna Ralston—it really does a lot to make this film special. By the way, have you seen the old “What’s My Line?” from the 50’s with Lloyd as the mystery guest? (Still on YouTube, I believe.) At the end they discuss a revival screening of the film and Lloyd mentions how audiences still loved it. Yup, have seen that one on YouTube! He was delightful, still full of energy. It’s hard to believe he was around 60 at the time! Hi Lea. That was an excellent choice. 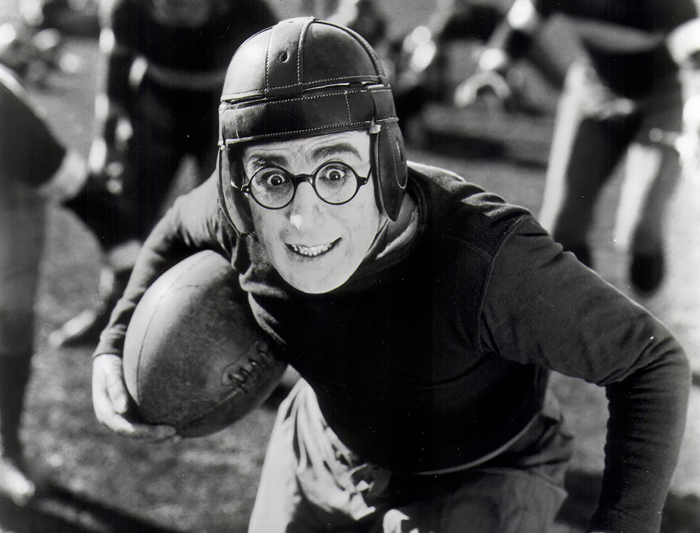 You are right, we don’t give Harold Lloyd’s movies enough love and respect. “By the way, I get a kick out of how there’s absolutely nothing in this film about classes or studying of any kind.” — Yeah. I find this one painful to watch while Harold is riding for his fall, but it makes it that much better when he gets up and triumphs. Yup, I have heard of that–I think there’s some stills floating around showing Buster in his (American) football uniform, too! I agree with your closing comments about how, today, optimism and joy is something that has to be earned rather than something to be celebrated from the off. That ‘happy’ can’t be intellectual or stimulating, unless it’s attained through a challenge. I haven’t actually seen any of Harold Lloyd’s films, but I look forward to exploring them through that lens. Definitely check out Lloyd’s work, you’ll be happy you did! It’s easy to see why his films appealed to young and old back in the ’20s. They still do today. And getting to actually watch the scene where he dangles from the clock in Safety Last is a treat. It’s somewhat like the moment when you first see a famous monument in person! Such a thoughtful piece on what works in a comedy. I have to confess that I haven’t seen Lloyd yet, but obviously need to! I love The Freshman as well – especially the title cards, some of the funniest I’ve ever seen. It’s amazing how a film that is 90 years old can mean so much to us, and has a character with whom we identify. 90 years old, but it’s timeless! Nice to see you again, Le! Best title card ever. 😀 I read your account of getting to see The Freshman recently–what a lovely theater! i love Buster the best, but I believe “The Freshman” to be possibly the funniest film I’ve ever seen. When Lloyd is at his best, as in “The Freshman”, you realize the margin of greatness between these guys is so thin….as you couldn’t possibly improve on “The Gold Rush” or “The General”, you couldn’t possibly improve on “The Freshman”. And still as potent as it was then, this could be a modern college comedy, as is.